besides our garden, another reason i've been lamenting summer's end has been my failure to attend any estate sales or garage sales. i think i may have made up for it today! 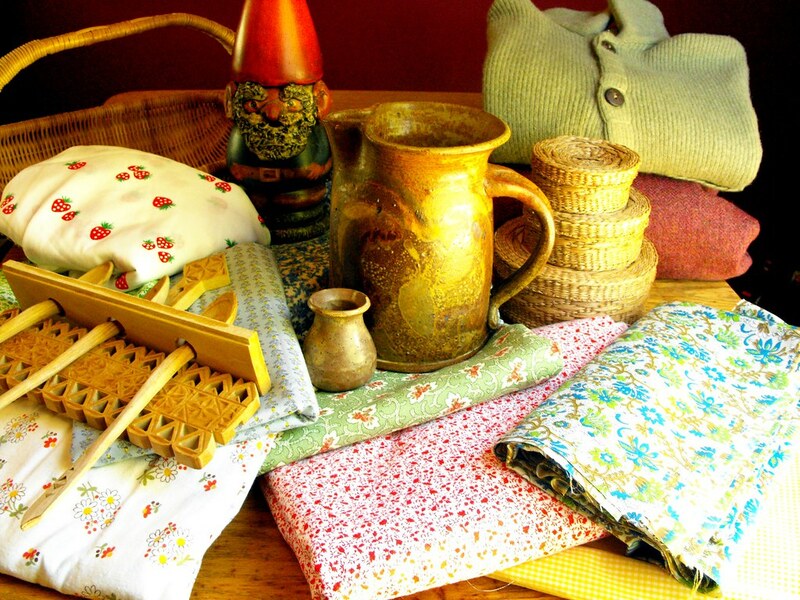 some of these fabrics were actually free! and the rest of the lot was ridiculously cheap. colden is especially thrilled with the nesting lidded baskets, and the hand-carved wooden spoons (which we're thinking of mounting in his play kitchen). he would also like to play with the gnome and the pitcher, but i want to be sure to test them both for lead paint. it's just better to be safe on that one. i also like to wave around a little sage incense before welcoming used things into our homes. the fabrics of course, also get washed and out in the sunshine to dry. have you been sale-ing this summer? do you perform any sage-ing or paint-testing or sun-purification with your thrifted treasures?